Watch this short clip here, don’t miss. Which School Did He Go To? Source: mikeysFunnies.com and image from health.howstuffworks.com. you stop at the red and speed on the green. Pray, tell me, before I say ‘watermelon’. when do you start on the red and stop at the green? you can find it here in the comment. Sorry, New Year revelry, my first guess too, is not it. One more of Akbar-Birbal stories never told before! Emperor Akbar held an open court on certain days of the month when any of his subjects with a grievance could walk in and seek help or justice from the court. On some occasions, the emperor himself would hear the matter and deliver judgment. On other days it was left to a senior minister to stand in for him. On this day when the brothers Ram and Kishan took their matter to the court, Akbar himself was in the seat. The two brothers inherited a large tract of fertile cultivable land from their deceased father. Unfortunately there was no will, the father’s death being unexpected and sudden. Goaded by their wives the siblings decided to part ways and were at loggerheads over equitable division of the property. It was a pretty straightforward matter to resolve. Akbar had one of his officials do some measurements and calculations on the map produced by the brothers. Very quickly an area was marked for Ram and another for Kishan. Akbar went into consultation with his official and found it to be true. More measurements and more calculations and the boundary was redrawn. For the first time Akbar’s visage broke into what could be described as a frown. Back to the drawing board. This time they were more careful to propose a solution that took into consideration several considered important by the brothers. An exasperated Akbar concluded there was just no way of arriving at a mutually acceptable division between the two brothers. This was worse than a cat’s ball of wool. No, he knew exactly what he would do. Now he would propose a solution that is as fair as possible and the brothers would have no choice but to lump it. That was that. No one can fault him for not trying hard enough. So Birbal was summoned and briefed about the dispute. The details of Akbar’s unsuccessful attempts in solving the dispute were tactfully held back. Birbal smiled for he had come in a little earlier and was fully in the know of what had happened. 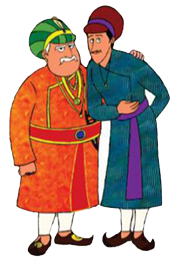 Beset with curiosity, Akbar let it be known he wasn’t budging and asked Birbal to proceed forthwith. 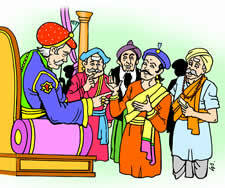 Silence reigned for a while as the ingenuity of Birbal’s clever scheme slowly sank in. And when it finally did, Ram and Kishan had to agree this was best for them. Akbar shook his head in disbelief turning into admiration at the simplicity of Birbal’s solution to what seemed to him only moments ago as an intractable problem.